SAME DAY SHIPPING for orders received by 3PM (CT), Mon-Fri.
gThankYou! Pizza Gift Certificates are an appreciated employee gift! Good for any brand, any variety of frozen or fresh grocery store pizza. Redeem at virtually any U.S. grocery store chain. Your organization name printed on Certificates. Free! FREE Enclosure Cards with your custom message and logo (if desired). Why share the gift of pizza? Pizza is the #1 favorite comfort food among Americans of all ages, according to Harris Poll. Everyone enjoys pizza and associates it with getting together with family and friends. In the workplace, teams love pizza! It’s the classic team-building treat. Pizza is also a popular way in the workplace to celebrate a good day, a success or a birthday. What are Pizza Gift Certificates? gThankYou! Pizza Gift Certificates are good for any brand, any variety of fresh or frozen grocery store pizza. Recipients redeem their pizza vouchers at virtually any major grocery store chain in the U.S.
gThankYou! Pizza Gift Certificates work as Manufacturer Coupons, just like cents-off coupons. They are good for any combination of pizza purchases and available in budget-friendly denominations of $5 and $10. Watch our two-minute video to the right and learn how gThankYou makes workplace gift-giving easy, convenient, and affordable — at the holidays or anytime! Pizza Gift Certificates: The easy way to celebrate your team! New research is backing up what successful organizations have known all along — appreciating employees day in and day out feeds productivity, retains employees and transforms workplace culture. gThankYou! Pizza Gifts are an easy and affordable way to show appreciation everyday or on a special day. Recipients love the ease of redeeming for their favorite kind of pizza, when they want it, at the grocery store of their choice. Delight your team with the appreciated, convenient gift of a pizza certificate! Pizza appreciation gifts are a fun team-building tool for managers. Share with your supervisors to hand out at a special team meeting, as party favors at a team lunch or for celebrating a team achievement. Employee welcome gifts for new hires and interns send a message from day one that your company values and appreciates its staff. Pizza is the crowd-pleasing gift that says, "Welcome! We're glad you are part of our team." Employees need to know their safe choices matter in the workplace. Incentivize safety with pizza gift awards! When your virtual or work-from-home employees can’t join a company party, help them feel included in the festivities with a party favorite they can enjoy, too – pizza! Make your Employee of the Month feel special: a gThankYou! Pizza Gift Certificate shared with a sincere Thank You and hearty handshake. Need a consistent, reliable way to motivate excellent performance? Employees who receive instant recognition understand immediately what they did right — and are motivated to keep it up. No one’s ever too old for a pizza party! Wish team members “Happy Birthday” with a gift they can enjoy with friends and family. Keep a stash of certificates for pizza for spontaneous moments of gratitude — a “Thank You” for outstanding customer service, for example, or great workplace mentoring. How do I order Pizza Gift Certificates? Order online or call us at 888-484-1658. Your Certificates can arrive as soon as next business day. Virtually all gThankYou orders ship the same day they’re received. We’re also happy to work with your specific delivery timing needs and we offer volume pricing — just give us a call. What does a gThankYou! Pizza Gift Certificate look like? Personalization of gThankYou Certificates is always free! Recipient and Giver names can be added to any of our Certificate varieties. 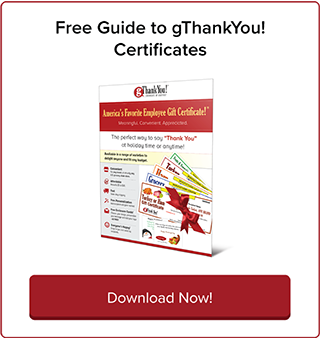 Add a FREE ‘Thank You’ Enclosure Card to your employee gift! All gThankYou! Gift Certificates come with customizable Enclosure Cards with room for your personal message and organization logo — all free! 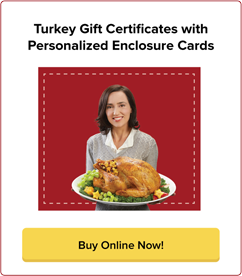 gThankYou offers dozens of Enclosure Card designs to choose from, including a Pizza-specific design as well as designs for every season and holiday. Choose the Enclosure Card design that fits your occasion and workplace culture by browsing our collection. gThankYou’s Enclosure Cards are 3-inches high by 4-inches wide (3″ x 4″) and printed on high-quality cardstock. Step 1: When you order online, we’ll ask you if you would like the free cards. Click “Yes”! Step 2: Once your purchase is complete, you’ll receive an email with an ordering link for your free cards. Click the online-ordering link and choose the design you would like, add your personal message and upload an organization logo if you would like it included. Step 3: We’ll send you a layout of your custom card design to approve. Once you love the card, we include it free with your order. Step 4: Sit back and smile! We do all this and still ship same day. We offer more than Pizza Gift Certificates! 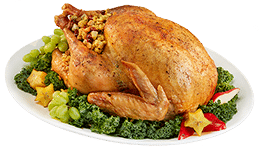 Choose from a variety of our popular food Gift Certificates perfect for workplace holiday gifts, anytime appreciation, wellness incentives and customer promotions. You select the variety and value that best fits your objectives and budget!